A flight passenger in Louisiana recently took a delay in stride as he grabbed an airport intercom and broke into song to bring joy to his fellow flyers. 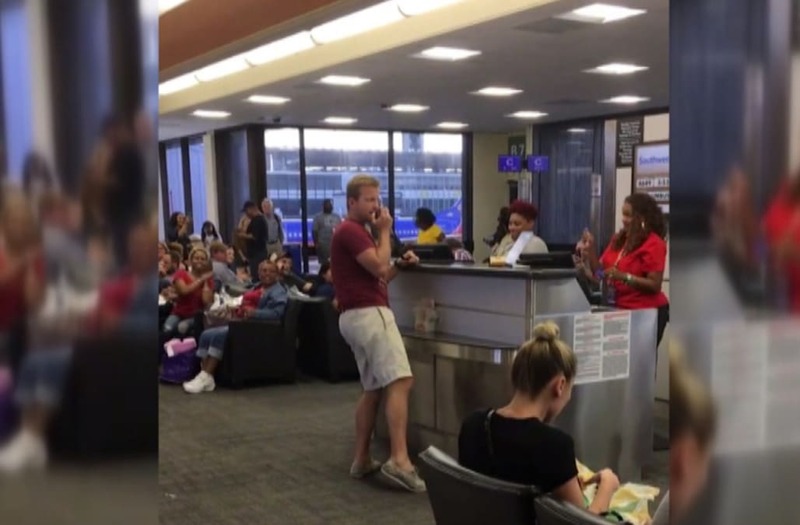 The unidentified man was among passengers waiting for their flight at Louis Armstrong Airport in New Orleans on Sept. 24 when he decided to ease the frustration by belting out a song. The video, which has been seen more than 15 million times on Facebook, begins as the man concludes a rendition of Oasis' "Wonderwall" before he really showed off his performance chops with Blackstreet's "No Diggity." As he performed the tune, he started to shimmy around, bringing laughter and smiles to other passengers, who were seen cheering him on in the 72-second clip. While it didn't speed up their time at the gate, the man brought on a much-needed distraction to those waiting. As soon as he finished, they gave him a round of applause as he hugged the gate crew and thanked them for the mic.